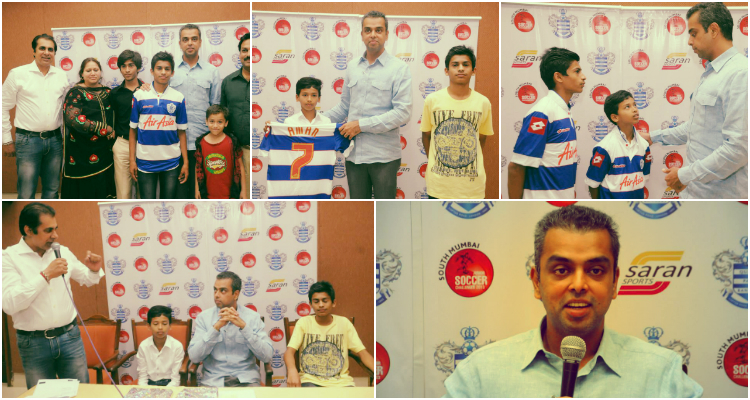 On 27th March 2014, Mr. Milind Deora felicitated 2 Winners, Kamran and Aman of the South Mumbai Queens Park Rangers (QPR) Junior Soccer Challenger 2013 at Indian Merchants Chamber (IMC), Churchgate. The winners will now be sent to Queens Park Rangers (QPR) FC for a 3-week long training programme. This annual community football event for youngsters is an initiative by Mr. Milind Deora (Milind Deora Initiative, MDI) in association with Queens Park Rangers (QPR), a London based football club which has a youth academy and youth development programmes. The event is managed by Saran Sports and receives participation from over 5000 participants, aged 6 to 16 years.